Story reported to Gariwo by Ms. Maria Rosa Romegialli, death camp survivor. 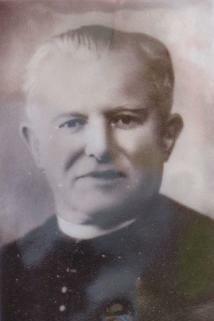 Father Piero Folli was born in Premeno (Verbania) on 18 September 1881. He was ordained in 1904, and soon became active on the side of workers. In 1909 he was moved to Tradate (Va) where he accomplished his mission within the Azione Cattolica. In 1915, amidst WW1, he was priest at Carnisio, again on the people’s side: he created a factory to fix the military uniform, providing the village with an actual aid. With the rise of fascism, father Piero was filed, and submitted to the humiliation of ricin oil and beatings. Many people also accused him of being too modern, so he was moved to Voldomino, where he took care chiefly of the young people, founding an athletic team, a theatrical school, the local library, the professional training school and the Schola Cantorum. Immediately after the armistice, father Folli got in touch with the Comitato di Liberazione Nazionale and lend his aid to the partisans of San Martino, also stretching out sheets to indicate the passage of the Nazi convoys. His generousity did not only concern partisans, but also the Allied prisoners, the political persecuted and the Jews (like Piero Malvestiti, senator Scoccimarro, Dino Segre). The parish of Santa Liberata was always open for the refugees, whom Father Folli helped reach Switzerland. Although the expatriation of Jews was not comprised in the military goals of the CLN, father Piero proudly affirmed that “it is a Christian obligation to rescue those families”. His network, also linked to the Fraschini and Lazzarini bands and the OSCAR and DELASEM networks – was known also the Allied forces and relied on priests on the Cote Azure, Tuscany, Liguria, and relations with Massimo Teglio and Cardinal Boetto of Genoa. On 3 December 1943 a punitive expedition hit his parish. Father Folli was jailed in San Vittore for three months. He underwent torture and violence without ever revealing the names of his aides. He was freed upon intercession of Cardinal Schuster and then confined to Cesano Boscone (Milan). Once the war ended, he got back to Voldomino and he died there in 1948. Gariwo would like to thank Ms. Maria Rosa Romegialli (www.mariarosaromegialli.it) for all the information and the detailed correspondence she provided to the Editorial Staff.